As they go “all-in” on digital learning, schools are demanding more from their networks. The shift to personalized and inquiry-based learning not only engages students more effectively, it depends on efficient technology. First as consumers and then as educators, schools are committing to mobile technology as their preferred method of digital interaction. More complex systems are now required to support two to three devices per student or staff member. Security cameras, HVAC systems, and other IoT devices also need to reside on the network. A single network may need to support hundreds or thousands of devices. Every device is a potential entry point to the network, so robust security is critical. Streaming content and simultaneous testing put heavy demands on a network that needs to supply high-density connectivity so that the technology is seamless, dependable, and invisible. Many schools and districts need to do massive upgrades to support today’s classroom demands and build capacity to handle the future. Each district has unique sets of goals and aspirations for their students, so networks must be flexible enough to provide the technology needs for seamless, 24/7, comprehensive connectivity that fosters student collaboration, engagement, and other 21 Century skills. To design and implement the kinds of wireless/wired infrastructures needed today, districts need a strategic partner who can help them achieve their vision of preparing their students for college or career. 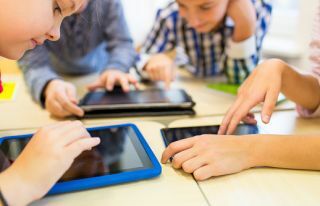 It’s not just a question of more technology, emerging learning environments require technology that supports mobile, student-driven collaboration, creativity, critical thinking, and communication. Because the needs of schools and districts are different from those of businesses, the best kind of strategic partner is one that has experience in helping K-12 schools and districts achieve their goals. Security and efficiency are important, of course, but supporting instruction and learning goals for individual classrooms, schools, or districts has unique challenges. Redesigning schools to facilitate collaboration means that instead of traditional classrooms, schools are focused on creating flexible learning spaces that can accommodate small or large groups of students working together on learning projects. Aruba provides a range of network solutions for K-12 schools and districts. Experienced with working with educators and administrators, Aruba understands the unique challenges of building secure and reliable networks that handle the demands of streaming digital curriculum and thousands of mobile devices, whether they are school owned or BYOD. Providing mobility connectivity throughout 15 million square feet of facilities makes enterprise Wi-Fi a top priority for Frankie Jackson, CTO of Houston’s Cypress-Fairbanks Independent School District. It’s evident that today’s #GenMobile students are showing up in classrooms knowing more about technology than previous generations. They’ve grown up tech-savvy and prefer to do everything on mobile devices. For them, untethered digital learning is fundamental for future success. Today’s students learn about the world and their social life on mobile devices. Bringing that experience to school by allowing them to easily access content and learning tools on a similar mobile device just makes sense.